New Brunswick tourist information with details about travel to and around New Brunswick. Where to stay and what to see is made easier with insider tips and hand-selected New Brunswick links, by dedicated editors and visitors to TravelNotes.org - The Online Guide to Travel. About New Brunswick, New Brunswick Accommodation, New Brunswick Attractions, New Brunswick Tourism, New Brunswick Tours, New Brunswick Transportation, New Brunswick Weather. The capital of New Brunswick is Fredericton. New Brunswick, the largest of Canada's three Maritime provinces, is nestled under Quebec's Gasp� Peninsula and beside the State of Maine. Its northern border also includes the Restigouche River and the Baie des Chaleurs. New Brunswick has some fabulous beaches and the world's highest tides (on the Bay of Fundy). New Brunswick was one of the first provinces, along with Ontario, Qu�bec and Nova Scotia, to join together to form the Dominion of Canada in 1867. Book New Brunswick hotels online to save yourself time and money. Find hotels in New Brunswick with special online rates. Hotels in Fredericton, Hotels in Moncton, Hotels in Saint John. Cape Jourimain Nature Centre (Moncton to Prince Edward Island). Fundy National Park (Between Saint John and Moncton). Hopewell Rocks (Between Moncton and Fundy NP). King's Landing Historical Settlement (Trans Canada Highway 2, west of Fredericton). Kouchibouguac National Park (Route 117, near St-Louis). La Dune de Bouctouche (North of Moncton). Mactaquac Provincial Park (24km west of Fredericton). Magic Mountain Water Park (Magnetic Hill, near Moncton). New Brunswick Botanical Garden (St-Jacques, north of Edmundston). New Brunswick Museum (Saint John). Parlee Beach (Pointe-du-Ch�ne - Route 15, NE of Moncton). Sackville Waterfowl Park (Trans Canada Highway 2, SE of Moncton). Saint John Reversing Falls (Fallsview Ave). Village Historique Acadien (Near Caraquet - NE New Brunswick). The major populated areas in New Brunswick are Saint John, Moncton and Fredericton. Experience the highest tides on the planet on the Bay of Fundy or the magnificence of Chaleur Bay; designated as one of the most beautiful in the world. The goal is to circle the entire inner area of the famed Bay of Fundy. This tour is for experienced cyclists. Moderate riders prepared for taking a bit more time and 'getting there when they get there' should also do well. If you're over in St. Andrews, on Passamaquddy Bay (west of Saint John), the 'Jolly Breeze' (a 72 foot gaff rigged square rigged cutter) makes three daily departures from mid June to mid October. New Brunswick has a number of airports, for those who like to fly: Bathurst Airport (ZBF), Charlo Airport (YCL), Chatham Airport (YCH), Fredericton Airport (YFC), Gagetown Airport (YCX), Moncton International Airport (YQM), Saint John Airport (YSJ) and St. Leonard Airport (YSL). Air St-Pierre also flies from Moncton to St-Pierre and Miquelon, a part of France in North America, just south of Newfoundland Island; with connections to Halifax and Sydney (Nova Scotia), Montreal (Quebec) and St. John's (Newfoundland). 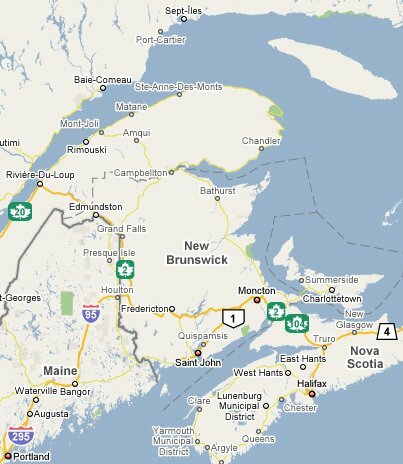 If you're travelling by car New Brunswick is connected to Quebec (through Edmondston) on Canada 20 and Route 185. There are a number of routes into the province from Maine (it's a good day's drive on the I-95 from Boston, Massachusetts) and you can even continue on from Moncton to Halifax, in Nova Scotia; or Charlottetown, on Prince Edward Island. For rail travellers, VIA Rail Canada's Ocean train goes from Halifax to Quebec City and Montreal; via Sackville, Moncton, Rogesville, Newcastle, Bathurst, Jacquet River, Charlo, Campbellton and Matapedia. From Matapedia (on the New Brunswick/Quebec border), you could even hop onto the Chaleur; if you fancy travelling along Quebec's Gasp� Peninsula. View a graphical weather forecast for the week ahead in New Brunswick. Bathurst, Dalhousie, Edmundston, Fredericton, Moncton, Newcastle, Saint-Jacques, Saint John. Nova Scotia, Prince Edward Island, Quebec. 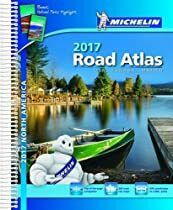 New Brunswick Travel Guides - Map of New Brunswick.